THE PICKIEST EATER IN THE WORLD: A G'DAY FOR OUTBACK STEAKHOUSE'S LUNCH SPECIALS! A G'DAY FOR OUTBACK STEAKHOUSE'S LUNCH SPECIALS! I've always loved the food, but for some reason, I had never gotten around to making a return (Which is weird because, although i'm not exactly Mr. Megabucks either, I'm fairly certain that I can afford more than just half a Pork Chop by now hehe). When an opportunity came along to try Outback's New Lunch Specials, I felt like a giddy college kid once again! Dining in Outback gives you the experience of eating at an Australian Steakhouse. The wooden interiors have a Western feel to the place, without it looking too much like the Old West. 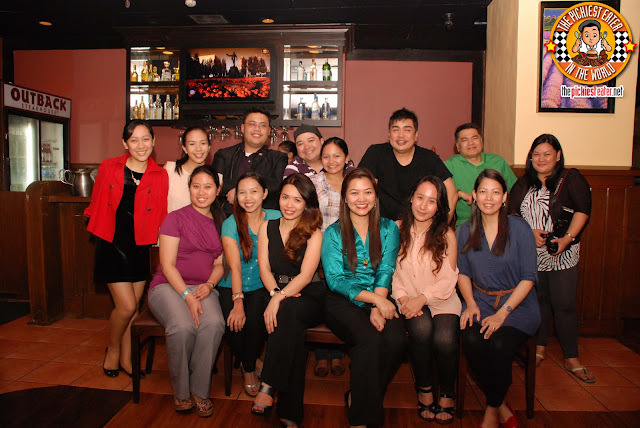 When I arrived, Rina was already there with our other blogger friends. Excited, I asked her, "What's good?" and she excitedly answered, "The Salad!!". Umm.. Okaaaay. The carnivore in me was a little confused.. This was a steakhouse, right? I took a look at the salad in question, and understood why Rina loved it so much. 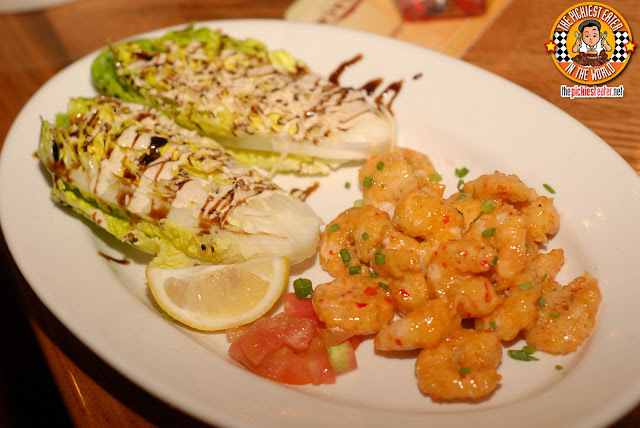 Had I seen the menu earlier, I would have easily guessed that The Crispy Shrimp Cesar Salad (P499) was something Rina would not let her pass her by. Rina loves shrimp, and one of her frustrations with me is that I never order any shrimp dish, save for Shrimp Tempura or Village Tavern's Blackened Shrimp. This had crispy Baby Rock Shrimps lightly coated with an Asian Chili sauce, and served with a side of the heart of Romaine Lettuce, drizzled with balsamic vinegar reduction. 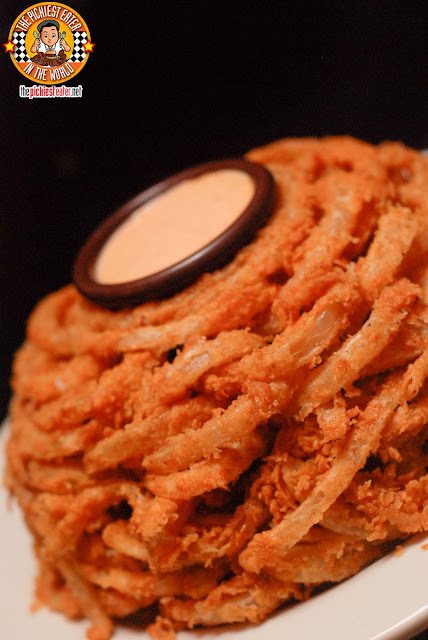 Sometime last year, Rina and I were watching a show that featured Outback's famous "Bloomin' Onion'. After watching that show, Rina was craving for the Bloomin' Onion so badly, I thought our marriage would be on the line if I didn't take her soon. The days leading up to our Outback visit, I would constantly remind her that she would finally try the Bloomin' onion that got her mouthwatering (I had tasted it already and I made sure to rub in how good it was just to make her inis hehe). And it did not disappoint. Although the incarnation of The Bloomin' Onion in our shores is the "Typhoon Bloom" (P329), the flavor was pretty much spot on from what I remembered. Instead of it being a "Bloom", the deep fried handcut onion rings were intricately stacked, with the bowl of spicy dipping sauce perched in the center. Aesthetically, it was stunning, and taste-wise, it was amazing. The working man need not scour through the menu of Outback Steakhouse to find a meal that would fit him, especially if he's on the go. Outback has taken the liberty of pointing out a delicious selection of dishes he or she could choose from, with price points beginning at P199! Outback offers a trio of Flatbread Pizzas (P299) choose from as one of their lunch specials. The choice of the day was BBQ Chicken, which among the three (Margherita, Chicken Romaine) is what I would have ordered. 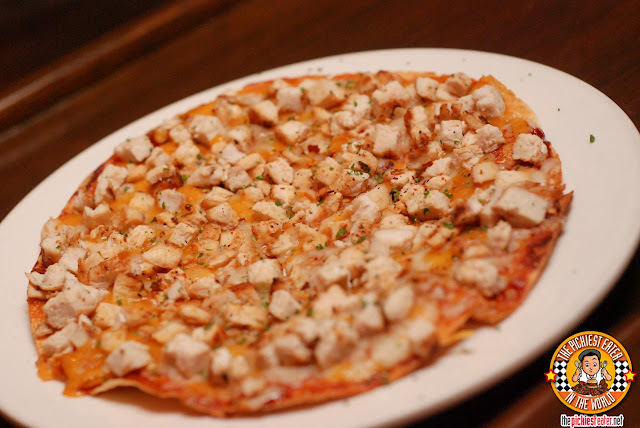 The flatbread had a nice crunch to it, and the tangy BBQ Sauce offered a nice punch of flavor that complimented the generous helpings of chicken, which covered practically every square millimeter of the pie. 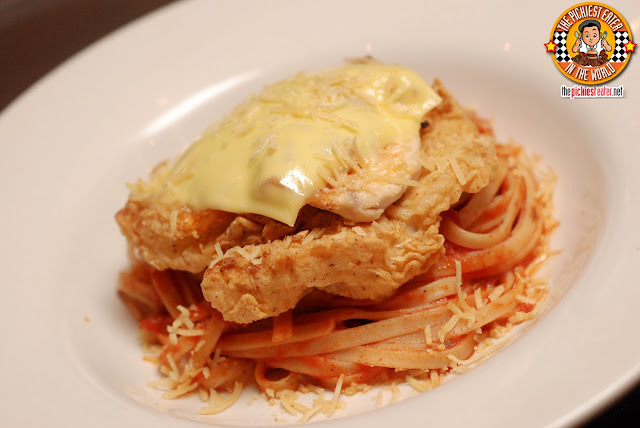 Since it was tomato based and I'm hyper-acidic, I was unable to taste the Chicken Parmesan (P299), but Rina enjoyed it as well. The acid on the tomato pasta sauce offered the ideal balance when mixed with the melted swiss cheese and shavings of parmesan. The Chicken Breast fillet was good, Rina admitted she would have preferred a thigh fillet instead. What I initially thought was beef kebabs, turned out to be something even better - Teriyaki Style Beef Medallions (P549). 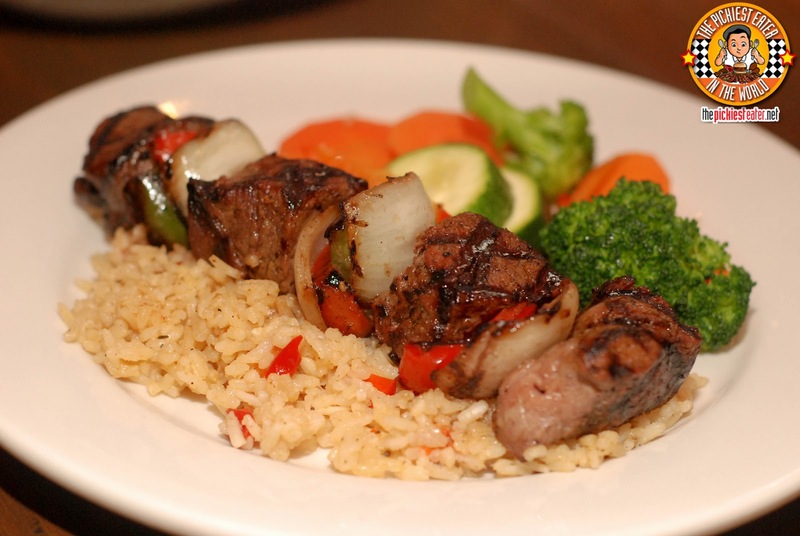 Gorgeous cuts of Teriyaki marinated beef steak served in over a bed of seasoned rice. The meat was incredibly tender, and had light, yet tasty sweetness from the teriyaki sauce. The side of vegetables looked even better in the extra plate I asked for from the waitress (hehe). 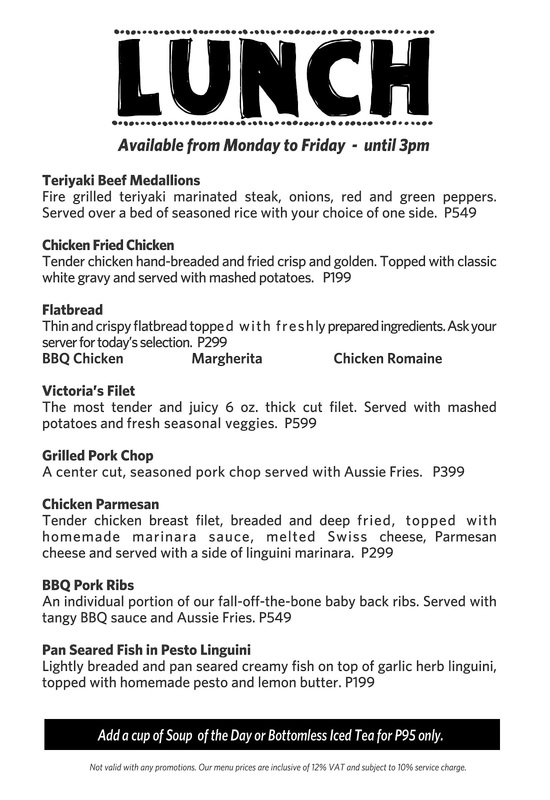 Steak lovers will be happy to know that included in the Lunch Specials, is the Victoria Fillet (P599). 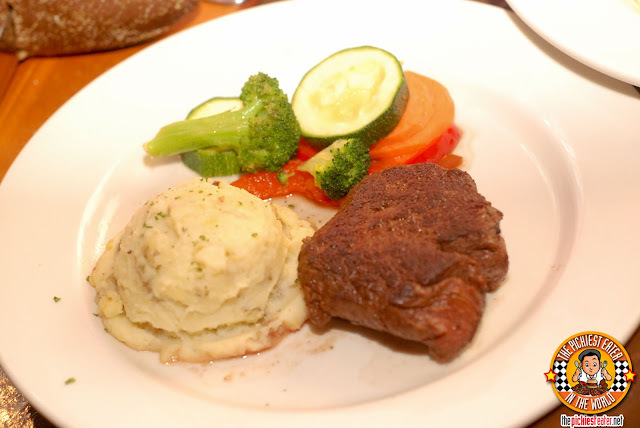 A glorious cut of juicy beef fillet, grilled to absolute perfection, with a side of mashed Potatoes and buttered vegetables. Although this was an exceptional piece of beef, I personally prefer steaks with fat, and lots of it hehe. The Big Kahuna of the evening was without a doubt, the BBQ Pork Ribs (P549). You know how some ribs are all bone and hardly any meat to it? 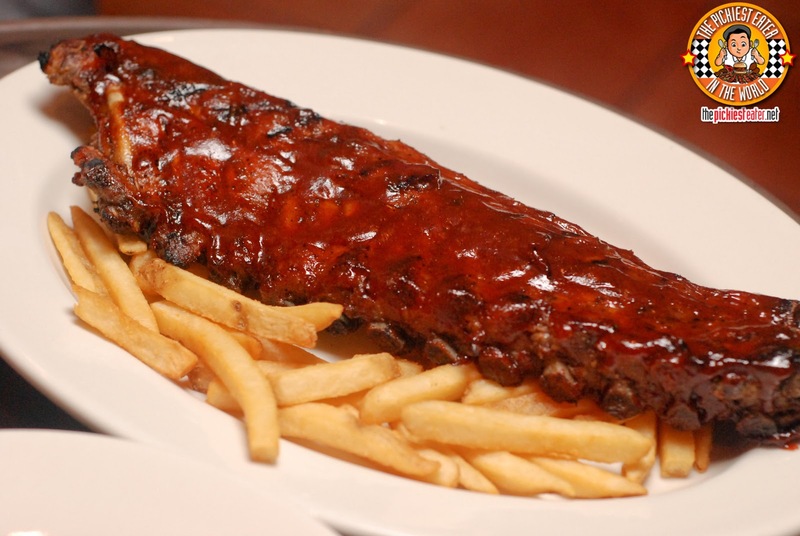 Well, this massive slab of fall-of-the-bone baby back ribs isn't one of them. The Ribs are coated in a thick layer of tangy BBQ sauce, and is laid out on a bed of golden Aussie fries. Funnily enough, as good as all the dishes I tasted were, the two dishes that stood out for me, were the two cheapest ones. 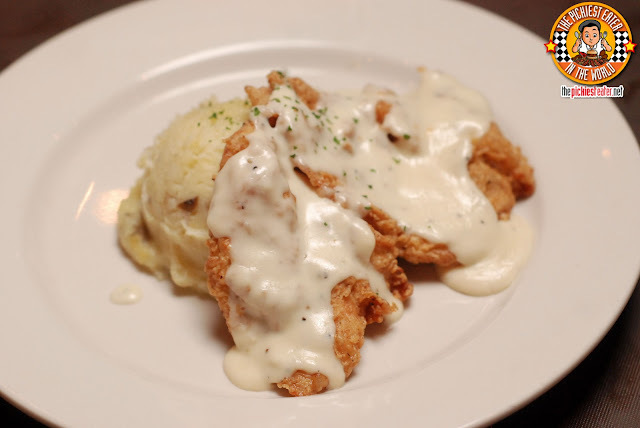 First off, Chicken Fried Chicken (P199) was definitely something that hit the spot with my taste buds. First of all, the gravy was phenomenal. It was creamy, flavorful and accentuated the flavor of the chicken, that was cooked to a perfect golden crisp. The Mashed Potatoes were silky smooth, and an amazing companion to the dish. 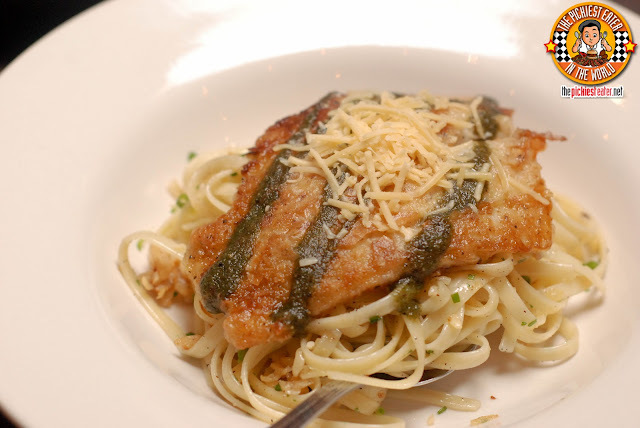 After knocking on Rina for raving about a salad in a steakhouse, I'm almost embarrassed to admit that my personal favorite of the night had to be the Pan Seared Fish in Pesto Linguini (P199). I'm a fan of Pesto. I'm a fan of White fish. I love cheese. And I Love oil based pasta. You put those four things together, and you get one happy Richie. The fish was cooked pan seared perfectly, giving it a light, crispy outer crust. The subtle flavor of the pasta was enhanced by the drizzling of pesto sauce on the fish. The Outback Steakhouse Lunch Specials are available from Monday to Friday, from 11am to 3pm! Outback's Steakhouse's signature dessert is the awesomely named Chocolate Thunder from Down Under (P315). 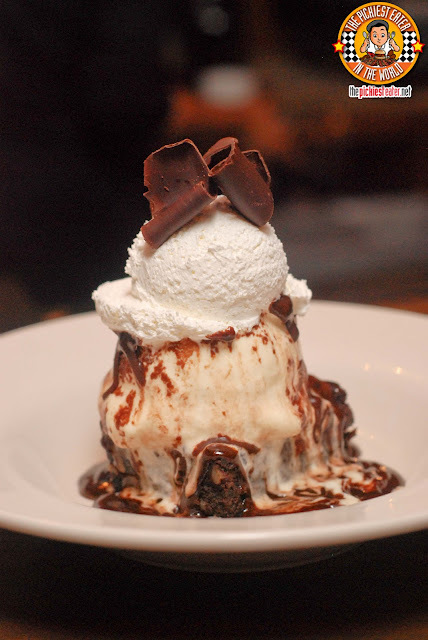 A freshly baked Pecan Brownie, topped off with rich Vanilla ice cream, drizzled with a delectable chocolate sauce, and topped off with whipped cream and shaved milk chocolate. I'm not ashamed to admit that I had to tell Rina to stop taking some bites of it because her reaction was starting to turn me on. 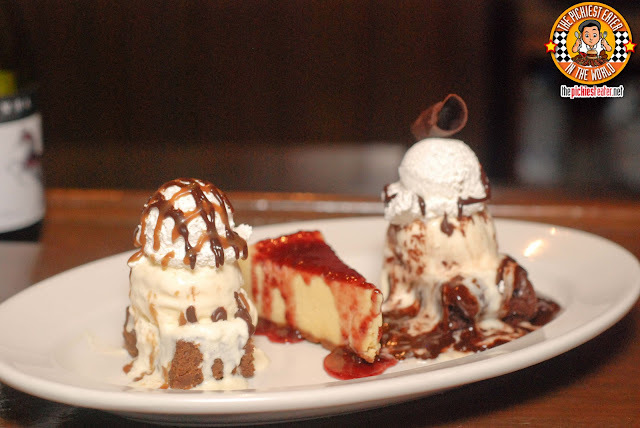 In case you can't decide on what to order for dessert, fear not, because Outback offers a Dessert Trio (P475)! The trio is led by The Chocolate Thunder from Down Under, A slice of Cheesecake (P205 ala carte) with your choice fo Raspberry or Chocolate topping, and Banana Nut cake (P245), which is a fantastic combination of banana, Toffee, Vanilla Ice Cream, whipped Cream, Nuts and Cinnamon. Considering the individual price of each dessert dish, the Dessert Trio is a huge steal! 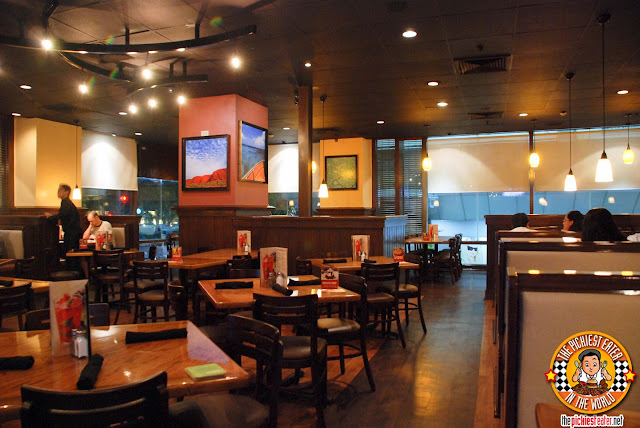 My blogger friends and I had a wonderful time at Outback Steakhouse, with everyone leaving with a glimpse of what it might feel to be 9 months pregnant. Whaddaya guys think about an Outback Steakhouse GC giveaway? I love the redundant chicken, too! Whenever I order it, I get a confused look from my server and they finally get what I meant after, oh, 3 seconds. Rina's Rainbow at Sabrina's Kitchen! 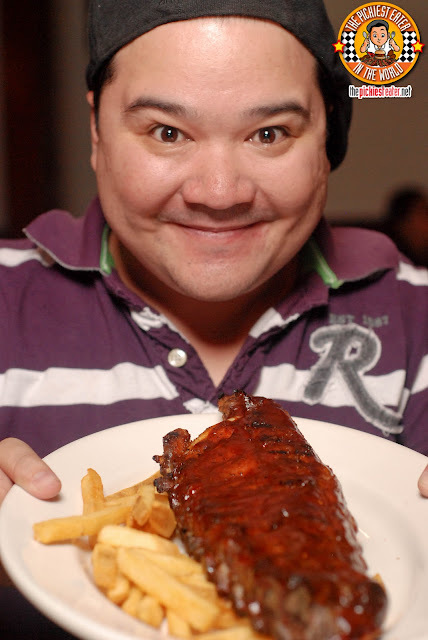 MEET BIG DADDY JAY'S, ALL AMERICAN BBQ! BEST FOOD FORWARD 2013.. AND A TICKET GIVEAWAY!